And I’ve got something even more interesting today. 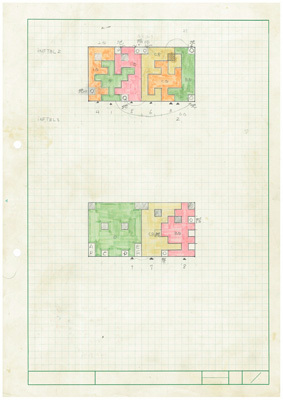 This is the first dungeon map ever created for Zelda. Basically, we were going to make lots of dungeons using one square per room, and lay them out like a jigsaw puzzle. In order to fit in as many dungeons as possible given the limited memory, you were making them like you were doing a puzzle. Right. Tezuka-san said, “I did it!” and brought this to me. I created the data exactly in line with it, but then Tezuka-san made a mistake and only used half of the data. I said, “Tezuka-san, there’s only half here. Where did the other half go?” and he was like, “What?! 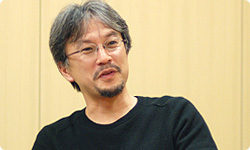 Oops, I messed up…” But Miyamoto-san said it was fine just like that. So, using the half of the memory that was left over, we decided to create the Second Quest20. 20Second Quest: A second adventure of greater difficulty prepared for players who had cleared the original quest in The Legend of Zelda. When you play this quest, Link on the select screen changes so he’s holding a sword. Huh? Just wait a second. If Tezuka-san hadn’t messed up, there’d have been no Second Quest? But it’s true! (laughs) And this is the original map for the Second Quest. Was it Miyamoto-san who suggested turning this into a second quest? He didn’t tell us to just remake the game. He said this was just right. He played it, and it felt just right. When I first heard the basic concept for Super Mario, there were five worlds. There are eight now, but at first there were only five? 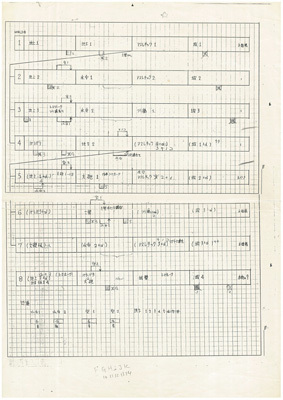 Miyamoto-san wrote them down on a sheet of A4 paper, and said, “This is what I have in mind.” He’d written down the outlines of five worlds. I said, “All right,” and then he said, “Actually there’s something else I’d like to talk to you about...” There was actually another sheet there. He opened it up, and the other three worlds appeared. In other words, he’d used an A3 sheet of paper. He revealed there were a few more. So even though the worlds increased, you used the same material, so it was no big problem. He wasn’t foisting an unreasonable task onto us. He was suggesting something possible. All the while plotting how to get me to agree. (laughs) I forgot to mention it before, so I thought I absolutely must this time. I’m surprised Super Mario was so fully laid out from the beginning. The other day, Miyamoto-san also saw this for the first time in a long while. He hasn’t changed in 25 years! 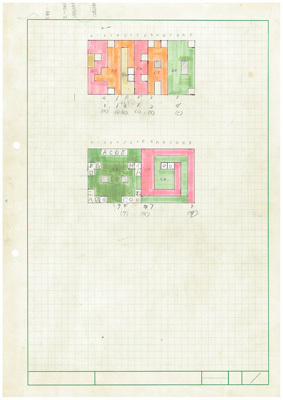 With this, and the map for Zelda we just saw, you were making games after establishing a view of the whole picture at the start. Learning that alone makes me happy I came today. It makes a big difference whether you have a vision of the complete picture or not. Right as rain! Oh, Miyamoto-san always says that. He wants to hear it from the others, and he wants to say it himself. Yeah. I think recently he’s realised that himself. That he wants to be put into a situation where he can say it. It’s fate that someone like that made Zelda. I completely agree. I see.